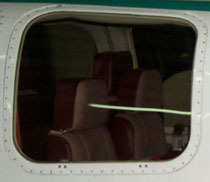 This Window is installed in the factory frame and riveted back into the aircraft. It comes in Green and Solar Gray. This Window is frameless and is held in by drilling holes in the edge for 6-32 countersunk screws. It comes in Green and Solar Gray. These Windows are riveted into the opening frame or the Non opening frame (note non opening type cannot be made into opening type) They come in Green, Solar Gray, Medium Gray and Dark Gray. 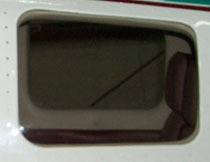 These Windows are for all aircraft with the long rear style. They come in Green, Solar Gray, Medium Gray and Dark Gray. 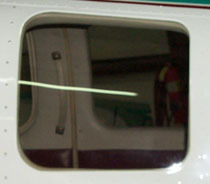 These Windows are for all aircraft with the Small rear style. They come in Green, Solar Gray, Medium Gray and Dark Gray. These Windows are for 36 and 58 models. They come in Green, Solar Gray, Medium Gray and Dark Gray. Copyright © 2015 DBM. All rights reserved.